You may have never heard of the Bahai religion, so here is a chance for you to learn all about the fascinating religion. The belief of the Bahai faith is that there is one God, and the diverse messengers from all religions are here for the same sole purpose. the bahai faith preaches the oneness of God and religion. The Bahai Gardens are a shrine for the latest messenger Bahaulla. The Graceful Gardens became UNESCO world heritage site known for their outstanding beauty and serene atmosphere. there isn’t one inch of the stunning garden that wasn’t thought through- Don’t miss it! Shrine and inner Gardens: 9:00-12:00 Daily. 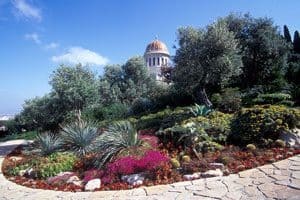 The gardens are closed on The jewish day of Atonement and on Bahai Holy days.